Full Users are the users whose work requires use of the feature rich business applications functionality. Examples of full users are sales people, customer service representatives, finance employees, controllers and supply chain managers. These users have also been referred to in the past as “Pro users” or “Power Users.” These full users are licensed with a Dynamics 365 Business Central subscription on a per named user basis and can choose between either the Essentials or Premium versions. Full Users-Essentials. The Essentials Version of Microsoft Dynamics 365 Business Central offers robust business functionality across financials, supply chain management, CRM, Human Resource and much more. Microsoft Dynamics 365 Business Central Essential Licensing is $70/named user/month. Full Users- Premium. The Premium licensing includes all of the functionality in the Essentials version and enhances the ERP solution further with 2 powerful additional components: Service Management and Manufacturing. Microsoft Dynamics 365 Business Central Premium Licensing is $100/named user/month. Team Members often represent a large percentage of users in an organization and may consume data or reports from line of business systems, complete light tasks like time or expense entry and HR record updates or be heavier users of the system, but not require full user capabilities. These additional users are licensed with Dynamics 365 Business Central Team Members. Microsoft Dynamics 365 Business Central Team Member Licensing is $8/named user/month. The Dynamics 365 Business Central Team Members subscription is a “named user” subscription designed for users who are not tied to a particular function, but who require basic Dynamics 365 functionality. This license includes read access as well as some write access for select light tasks across Dynamics 365 Business Central functionality for a given tenant. The Dynamics 365 Business Central Team Members Subscription License grants a user full read access to Dynamics 365 Business Central Essential and Dynamics 365 Business Central Premium for a given tenant. In addition, the Dynamics 365 Business Central Team Members SL includes some limited use write access to Dynamics 365 Business Central Essential and Dynamics 365 Business Central Premium. Microsoft Dynamics 365 Business Central Pricing is summarized below, however, this is for the Cloud Version of the system. The On-Premise version of has virtually the same functionality, however, the licensing is much different. Warehouse Management Systems are becoming more popular as supply chain logistics become ever more complication along with increasing customer demands. With an escalating volume of inventory movement, many organizations are turning to technology to streamline operations and meet these challenges. Advanced technology through Warehouse Management Systems (WMS) allow companies to respond to evolving market pressures and deliver on ever-shrinking time to delivery windows. These systems efficiently capture every scan, every movement of inventory and are designed to make both accuracy along with cost reduction a top priority. The following article can give you some insight into methods, obtained through warehouse technology, for achieving better warehouse management that are key to modern business supply chain logistics in addition to reaching your organization’s goals. Automation: Too many warehouses today are relying on manual processes which inevitably increases inventory errors and inaccuracies on a continual basis. Spreadsheets, paper and standalone systems can’t deliver the inventory accuracy and supply chain visibility it takes to stay competitive these days. Inventory Control: The proper and correct movement of inventory in your warehouse is critical for accuracy while also ensuring elevated customer service levels in addition to remaining competitive. Crock Docking: Cross Docking is a way to improve inventory warehousing by implementing a protocol to move inbound goods once received to a staging area, i.e, “cross docking” area, instead of warehousing and storing these products. Picking Options: The flexibility to have multiple inventory picking options can greatly increase warehouse efficiency. The Picking functionality in warehouse management systems is another core functionality designed to move the paper picking process to a wireless device by the most optimum method available. Space Utilization: The flexibility to have multiple inventory picking options can greatly increase warehouse efficiency. The Picking functionality in warehouse management systems is another core functionality designed to move the paper picking process to a wireless device by the most optimum method available. 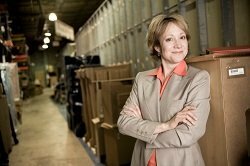 Labor Management: Reducing or allocating labor is another important driver for exploring warehouse management solutions and recognizing a return on investment (ROI). A properly implemented WMS system can reduce your labor needs, help you reallocate staff and or keep you from needing to bring on more staff to meet growing sales or seasonal fluctuations. Multi-Carrier Shipping: Checking the proper and efficient inventory movement should continue when we discuss shipping. Any sort of shipping solution should have the ability to shop all of major carriers which can select the best choice available. Reporting: Measuring results on a consistent basis is a key to determining if newly implemented warehousing initiatives and strategies are effective. With modern warehousing technology, this is accomplished through the ability to create, manage and view Key Performance Indicators (KPI’s) dashboards and analyze ad-hoc business intelligence using pivots, drill down, charts, and graphs. Boosting Customer Service: Another result of WMS technology is the ability to enhance your customer satisfaction numbers and most likely help you attract new customers without adding to your workforce. Although sometimes more difficult to quantify, such as a firm return on investment figure, an increase in better customer service levels is a positive intangible result from warehouse technology. Dynamics 365 Business Central is an all-in-one business management solution that’s easy to use and adapt, helping you connect your business and make smarter decisions. Built on functionality within Microsoft Dynamics NAV and adaptable to extend business applications to other Microsoft Cloud Services such as Office 365, Microsoft Flow, Power BI and PowerApps; Microsoft Dynamics 365 Business Central Solution can grow as your business requirements change while taking advantage of the latest technology. Warehouse Management Systems are becoming popular as supply chain logistics become ever more complicated along with increasing customer demands. 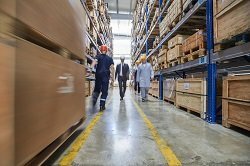 With an escalating volume of inventory movement, many organizations are turning to technology to streamline operations and meet these challenges. Advanced technology through Warehouse Management Systems (WMS) allow companies to respond to evolving market pressures and deliver on ever-shrinking time to delivery windows. These systems efficiently capture every scan, every movement of inventory and are designed to make both accuracies along with cost reduction a top priority. The following article can give you some insight into methods, obtained through warehouse technology, for achieving better warehouse management that are key to modern business supply chain logistics in addition to reaching your organization’s goals. Warehouse Management Systems are designed with savings in mind to manage your inventory in the most efficient manner possible. However, additional benefits can be recognized in other areas, such as cost saving associated with reduced labor and administrative costs, plus also an increase in customer service levels. While concrete return on investment numbers can be calculated such as an increase in inventory picking accuracies up to 99.9%, or the reduction in labor hours before and after a WMS has been implemented, intangible benefits should not be overlooked. These include an increase in customer services levels and reduced returned inventory as well. We are a Microsoft Dynamics NAV Partner offering implementation, service, and support for Microsoft Dynamics NAV in: PA, DC, DE, MD, NC, NJ, NY, OH, VA, WV, and the entire Mid-Atlantic Region. We are a Highjump Partner offering implementation, service, and support for Warehouse Management Systems in: PA, DC, DE, MD, NC, NJ, NY, OH, VA, WV, and the entire Mid-Atlantic Region.